Last week, Echoing Ida writers Cynthia Greenlee and Gloria Malone showed us the impact that history has on our present day views of Black women's bodies and the way we treat them. At The Guardian, Cynthia Greenlee discussed the recent Johns Hopkins Health System settlement that saw a $190 million payout because over 12,000 victims were recorded during pelvic exams by a physician and his pen camera between 1988 and 2013. While this news may shock some readers, Cynthia explains that this isn't really a new phenomenon - in fact, it's this type of invasion of privacy that gynecology was founded on. 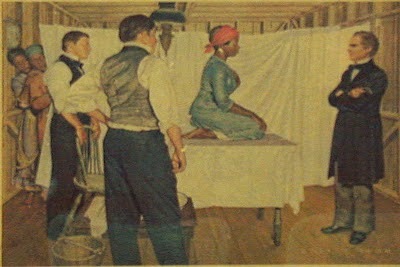 As "women's medicine" became a more popular specialty, medical students often polished their skills, such as they were, on black women because it was distinctly improper to lift the skirts and peer at the genitalia of white women. J Marion Sims, called the father of gynecology, honed his craft and developed his namesake Sim's speculum – one of the essential medical instruments for OB-GYNS to this day – through public and private examinations and operations on enslaved women (and later on impoverished Irish immigrants) suffering from gynecological conditions like fistulas. He performed these procedures mostly without anesthesia because, like many of his colleagues, he opined that black women were almost impervious to pain. Today, he's memorialized by statues in New York's Central Park and at the South Carolina State Capitol. The Hopkins settlement is thus the latest chapter in an all-too American story: black women's bodies have rarely been seen as private, are rarely accorded the same feelings or rights to consent as white women's bodies and were more often subjected to individual doctors' prurient interests or medical research. To this day, women who are poor, urban, black and brown have fewer choices of physician or facility. Specialists are often few and far between in America's urban corridors and rural spaces, and the numbers dwindle when you consider those who accept Medicaid. It's particularly difficult for patients – and particularly low-income ones – receiving subsidized care to question men in white doctors' coats. And in a system where a few doctors or clinics hold the key to services, it's understandable that you wouldn't want to jeopardize your care with even a valid complaint – or that lingering feeling that those brushes against your breast weren’t accidental. Over at RH Reality Check, Gloria Malone, who recently visited Kara Walker's A Subtlety, or the Marvelous Sugar Baby, noticed that people were posing in sexual and obscene manners with this beautiful and moving piece of art. She illustrates the connection between these acts of degradation towards Black women's bodies and the historic, yet inhumane actions of Dr. J. Marion Sims. While some people regard the photos as a “joke,” critics saw the photos as a continuation of the pain Black women have lived with and continue to live with, from the forced sterilization of many Black women and women of color in the past and today, and Black women and women of color having birth control tested on them. The controversial photos taken at the exhibit are not only troublesome because they disrespect the art, but because the mocking and dehumanization of the Black female body has a long history in our society. After seeing the photos, I wanted to know how spectators could in good conscious photograph in sexually suggestive ways an installation that eerily replicated a position of one of Dr. J. Marion Sims’ enslaved Black female victims; this photo is one of the few available that presents as human mostly nameless and devalued Black women whose bodies were used to build the modern field of women’s reproductive health. While we can't change the past injustices that were done to hurt, violate, and humiliate our foremothers, we can explain how history is doomed to repeat itself unless we value Black women's bodies and stop viewing them as 'things' to experiment on. Perhaps once we view Black women as human, they will be able to to receive empowering care to keep their bodies healthy - like the healthcare they were harmed to create.